I did not get a picture of my favourite dish from the restaurant in my previous post. But that does not mean that I did not vow to recreate the mix of flavours at my earliest convenience! Slice the eggplant and salt it, set to drain for at least 15 minutes. At this point you can also start boiling the pasta al dente in a big pot of salted water. When the pasta and the eggplant are done (this should ideally coincide in time), drain the pasta, toss it with the cream and arrange on two plates. 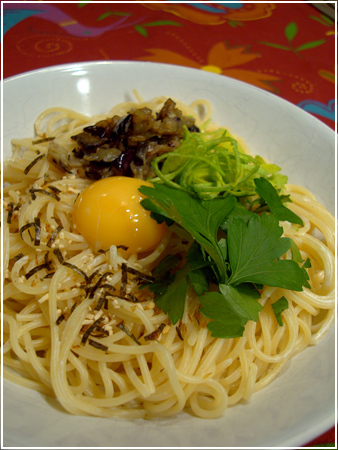 Arrange the eggplant, leek/spring onion, parsley and egg yolks on top. Sprinkle over the nori and done! Eat with chopsticks if you can, stirring in the yolk at the table. I’m submitting this to Presto Pasta Nights hosted this week on The Life & Loves of Grumpy’s Honey Bunch. 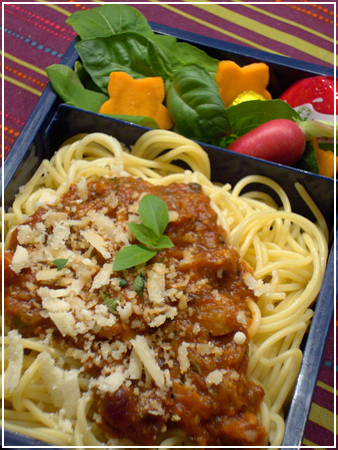 The main attraction of this bento is spaghetti with a roasted vegetable “bolognese” sauce, parmesan and some chopped fresh herbs. Sides are mixed lettuce (and some basil leaves) from the windowsill, carrot flowers, a radish, babybel cheese and another easter candy. 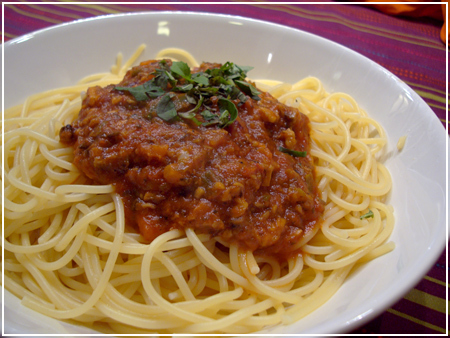 The vegetarian spaghetti sauce was quite simple to make! Basically it was born out of what I had in the fridge, but that doesn’t mean it necessarily needs refining. and some garlic cloves, tossed them with salt, pepper, a tablespoon of olive oil and some dried thyme, and set everything under the broiler to roast. While it was roasting, I set the tomato sauce base to simmer. That was a teaspoon of butter, some red chili flakes, a 500g packet of pureed tomatoes, a splash or red wine, salt, pepper and a teaspoon of sugar. When the veggies looked just about done, I pulsed them to a coarse texture in the food processor, mixed with the tomato sauce and done. Simple! 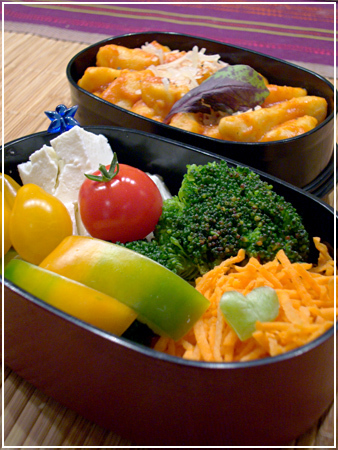 Monday’s not a good day for making bentos in the evening, so a somewhat less elaborate bento today. There’ll be more penguins later this week, be assured. Italian flag pasta – tossed with pesto and fried mangold on top, tossed with butter and parmesan on top, and tossed with tomato sauce and more of the same sauce on top. Not quite as Japanesely clean as three-colour rice but fun to make! Homemade gnocchi in tomato-bell pepper sauce (the smooth version of the recipe below) with parmesan and a basil leaf in the small container; Feta cubes (have to get some protein into me somehow), homegrown yellow and red cherry tomatoes, broccoli, bell pepper and grated carrots in the big container. Not the most inspired arrangement… I was tired. But it will be yummy! I’m also bringing a bottle of balsamic vinegar dressing for the veggies and feta but I forgot it until after the photo. To be honest, I was surprised at how simple the recipe actually was. If I had known that before, I would have made gnocchi much sooner! It was actually easier than making pasta. The main problem, as I had suspected, was that the instructions to quarter the potatoes before boiling had been made for big baking potatoes. The ones I can buy here are small – only 5 cm max on the longest side. When boiling them whole and peeling them afterwards, the dough got much drier and stuck together nicely with half the flour. Mash the potatoes and make into a sticky dough together with the rest of the ingredients. Roll into finger-thick sausages and cut off gnocchi. Boil in portions in salted water until they start floating. As simple as that! I still have cherry tomatoes ripening and since they’re so good, they deserved to be used reverently. Luckily, this sauce does them justice. Halve the bell pepper and roast skin-side up in the oven/broiler until the skin goes black and bubbly. Cool and remove skin. Cut the rest into thin strips and set aside. Blanch the cherry tomatoes in hot water and de-skin them (cut a cross in the bottom if they’re not all ripe – mine just popped out of their skins without any help though!). Try not to eat all of them like candy before putting them into the sauce. In a pan, heat olive oil and garlic. Add the tomatoes and bell pepper and let them melt into a still chunky sauce. Season with salt and cracked pepper. 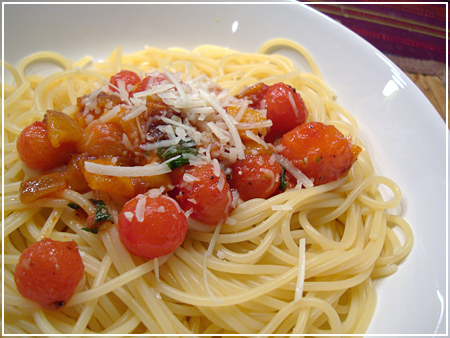 Serve with julienned basil leaves and Parmesan cheese on or tossed with the pasta of your choice. I’m submitting this to Presto Pasta Nights hosted this week by Heather at Girlichef. 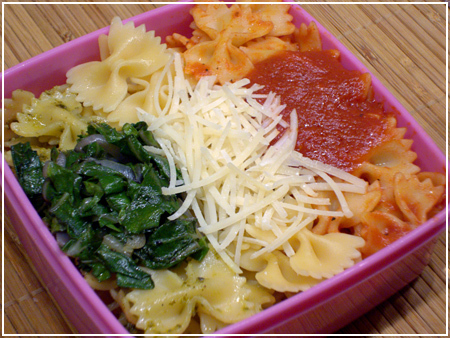 Organic ravioli with ricotta and spinach, tomato and roasted bell pepper sauce, parmesan cheese in the small box. 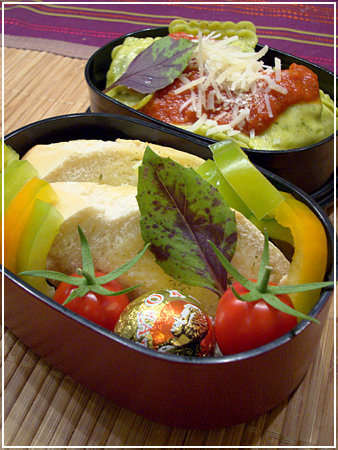 Two slices of garlic butter baguette (my coworkers are gonna love me for this =.=), green-and-orange-striped bell pepper slices, cherry tomatoes and a Mozart ball chocolate in the big box. Freckled Basil leaves as decoration. And they were good – one recipe specifically caught my eye and I had to cook it immediately! 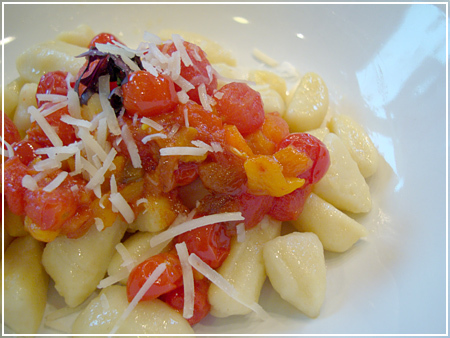 I’ve been looking for ways to use some more of my lovely cherry tomatoes, and gnocchi was a challenge I couldn’t resist. The result: I’m not sure I would recommend the magazine’s method of cooking the potatoes for the gnocchi – the dough got too watery and the gnocchi were quite soft in the end. But the taste was nice, and the sauce, with some changes from my side (I removed several ingredients to keep the taste of the tomatoes more pure) was delicious. 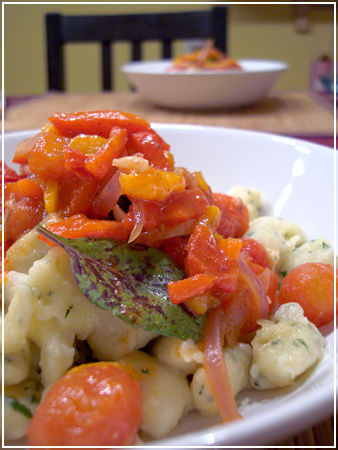 Gnocchi with parsley and tomato-ovenbaked bell pepper, onion and garlic sauce. Mom – can you print this out and send it to grandma when you get to it, please? Sorta-kinda veggie Milanese, even though the breading is wrong. 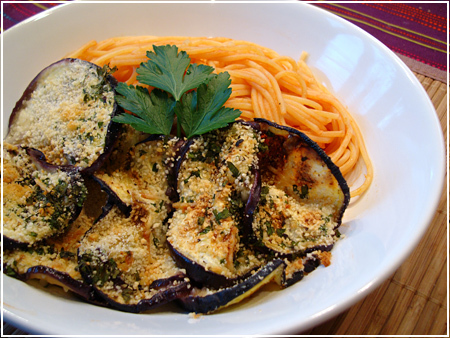 Pasta with tomato sauce; the eggplant is baked in the oven topped with olive oil, breadcrumbs, parmesan, parsley, salt and pepper. Next time I think I’m going to have to make the slices a little thicker.